The French Open, often referred to as Roland Garros, the French aviator for which the circuit is named, is the second of the four annual Grand Slam tennis tournaments. 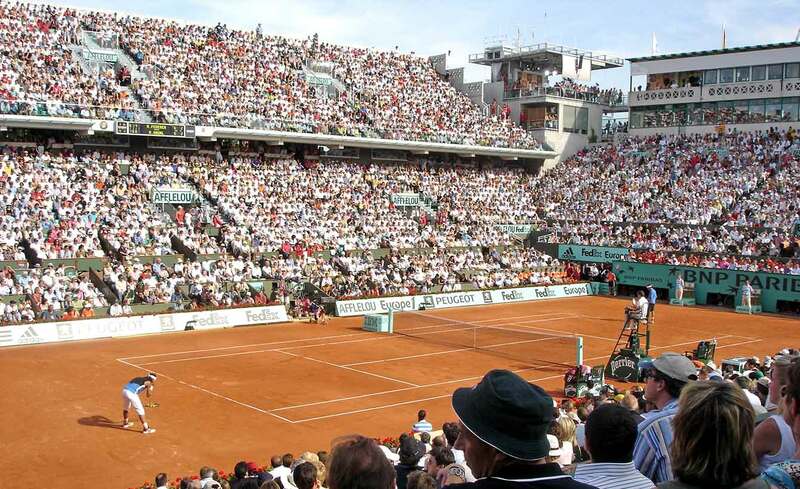 Considered the best clay court tournament in the world, it takes place in Paris over two weeks every May. Booking early has many advantages. 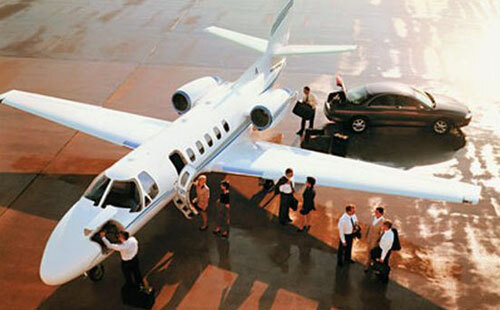 Enter a few details below to start planning your private jet flight to the French Open. The first French Open, then called the French Championships, was held in 1891. It bounced around before being given a permanent home at Roland Garros Stadium, which was built in 1928 to host the Davis Cup finals. After becoming the first Grand Slam tournament in 1968, it drew many famous players, including Bjorn Borg, who won six French opens, and Chris Evert, who won seven, beating Martina Navratilova twice. 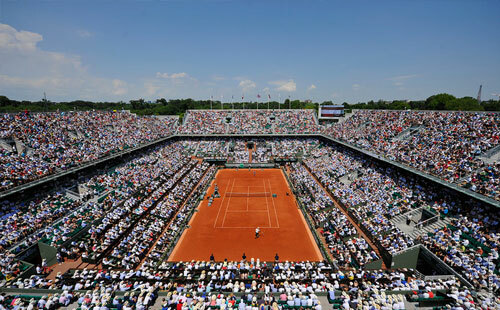 The 21-acre Stade Roland Garros has 20 courts, three stadiums, a large restaurant and bar complex, France’s national training center and the Tenniseum, a hands-on, multimedia tennis museum. The Courts are Red but are They Clay? No. Yes. Kind of. Not really. It’s actually white limestone covered with a thin layer of powdered red brick (baked clay) dust that has been pressed into the limestone with rollers. It shows footprints and ball marks without being spongy. The surface, which plays like clay but doesn’t have the drainage problems that clay does, was state-of-the-art when it was installed in 1928. And, it marked the beginning of the end of natural clay courts, which can be left unplayable for days after a rain. Natural clay courts have not been built in a century. And the courts at Roland Garros Stadium are the best, tennis star Venus Williams told the New York Times in a story about the Parisian clay. It takes about a month to get Roland Garros ready for each year’s tennis season. In April, the limestone surface is “tilled” and the resulting crushed stone is rolled and pressed back in shape. It’s basically white at that point, a glaring color for onlookers and a camouflage for the ball. Also, it doesn’t look like a clay court. So, about a ton of crushed brick is pressed into the surface of each court. Then it is wet down and the process is repeated several times. A thin red layer appears on top. At night, the courts are wet down and covered with a tarp. In the mornings, the court is “refreshed” with another thin layer of red brick. A spokesman for Roland Garros told the Times it uses about 50 tons of brick dust on its 20 courts every year. Sound like a laundry nightmare for the players? From the looks of all the red socks at the end of the day, it is. Take a boat tour down the Seine. This seems to be the one piece of advice for visitors that appears on virtually every list of Paris must-do’s. You’ll see a side of Paris you can’t see from anywhere else. Listen to soulful, seductive blues music in Le Caveau des Oubliettes, the oldest blues club in Paris. There is music five nights a week but Sundays are for the blues jams. There’s a bar upstairs but it’s in the 12th century basement wine cellar where the music is played that you will have an experience like no other. It’s located near Notre Dame on the Rue Galande. Get there early to get a seat. Visit a secret, romantic waterfall in Parc des Buttes Chaumont, one of the city’s most exotic parks. Then walk up – on one of three staircases or a winding road -- to a tiny 19th century hilltop village and an amazing view of Paris. An added surprise is that you’ll be looking over one of the few remaining vineyards in Paris. Visit the Musée de la Vie Romantique. You can learn about 19th century poets or just soak up the Paris that is portrayed in the movies, complete with tea and cake and pink roses. The former home of painter Ary Scheffer (1795-1858) located in the heart of Paris is dedicated to early 19th century arts and literature. Bring a bottle of wine and have a picnic or relax in the glass house next to the main house that used to be an art studio and is now a tea room. Scour the city for sweets. Find the best Parisian pastries. Visit the “Temple of Love.” In the middle of a lake in the Bois de Vincennes, the city’s largest park, is the Temple Romantique. The ruins are a great place for a declaration of love – or, even, a marriage proposal. See the cell in which Marie Antoinette was imprisoned and a real 19th century guillotine at La Conciergerie. This 700-year-old former palace served as a prison during the French Revolution. Walk the Quartier Latin. You’ll find some of the best cafes, bakeries and restaurants along the narrow streets of this neighborhood. Leave those locks behind. For years, lovers engraved their initials or some other symbol of their love on padlocks, affixed them to grillwork on a the Pont des Arts bridge and then tossed the key into the Seine River below, locking their love forever. Well, guess what? The keys – hundreds of thousands a month -- are polluting the river and the weight of the locks is causing bridge railings to collapse. Enough already, said Paris officials, who have been removing an estimated 45 tons of padlocks. Plexiglass is replacing or being used to block love-lockers from grillwork on the bridges. Exasperated residents have joined in, too, with their No Love Locks campaign.